Left: Jim and Amelia Gerling agree that the Bowl-a-thon is “Fun for everyone!” Right: pictured, left to right, Airika Greenfield, Mary Gearan, Stephen Fazio and Jamel Jackson. On Saturday, April 5, 2014, Sunset Bowl hosted the Boys & Girls Club of Geneva’s 7th Annual Bowl A Thon. Finger Lakes Bone & Joint Center was the event’s Presenting Sponsor, with Ciccino’s Pizzeria and Restaurant as food sponsor. This year’s event raised approximately $28,000 for the Boys & Girls Club of Geneva. A big thank you to this year’s lane sponsors: Bank of the Finger Lakes; The Presbyterian Church in Geneva; Finger Lakes Health Medical P.C. ; Vance Metal Fabricators; Century 21 Steve Davoli; Michaels & Smolak, P.C. ; Morgan Stanley; Billsboro Winery; Tuxill Group; Lowry Chiropractic and Wellness Care; Cam’s New York Pizzeria; Geneva Club Beverage; Assemblyman Brian Kolb; Guardian Industries; Dr. Rodney Littlejohn, D.D.S., M.S., P.C. ; Interstate Heating; Generations Bank; Lyons National Bank; Pedulla’s Liquor and Wine; Love Geneva; Geneva Police Benevolence Assocation; Red Dove Tavern; Reliant Community Credit Union; D’Amico Chrysler Dodge Jeep; Ken Steadman, M.D. ; and Knights of Columbus. Teams of up to four bowlers or individuals gathered pledges and bowled a game for the club. 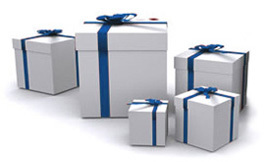 Prizes were awarded to the three participants who raised the most money. The first place winner was Sydney Snyder; Mary Jackson earned second place and Kevin Dunn earned third. The holiday season is always a time when the community extends itself to make a difference in the lives of the children of the Boys & Girls Club of Geneva – and the kids pay it forward. This was the case again this past year. For Halloween, 27 members donned costumes and went trick-or-treating at the Seneca Lake Terrace assisted living facility, which so generously invited them. The event was a “treat” for our members, and the residents also enjoyed having young costumed visitors on Halloween. Again this year, businesses and individuals gave Christmas gifts to the Goodman Street Center and Teen Center. These donations always make a huge difference in the lives of so many kids and their parents and are greatly appreciated. Among these, The Bank of the Finger Lakes donated four bicycles (two for each center). At the Teen Center, gifts were wrapped and given to members. The bikes were given to one male and one female member, selected through a random drawing. The Goodman Street Club hosted its annual shopping night on December 18. This temporary store provides items families in need can select as gifts for their children – free of charge. The BGCG received approximately 300 toy and gift donations from toy drives conducted by Wegman’s; BJ’s Wholesale Club; Three Brothers Winery; employees of The Gap; and The Young Professional’s Association. Fliers were sent home with kids and the club posted an announcement at the Geneva Housing Authority to announce the shopping night. Thirteen families attended and were able to select at least 20 gifts apiece. “One mother told me the next day, while holding back tears, that she had been able to purchase only one gift apiece for her four children. Our shopping night allowed her to provide a much bigger Christmas for her kids,” says Bob Ritter, Goodman Street Club unit director. Katharine Korona of the Finger Lakes Young Professionals explains the group “Chose to donate to the Boys & Girls Club of Geneva because it is a local organization that strives to empower young children in our community. Similarly, FLYP strives to empower young adults in the Finger Lakes region. The teens wrote thank you cards for the FLYP to show their appreciation for the gifts. In giving back to the community, Torch Club members participated in such activities as bell ringing for the Salvation Army, assisting with Shopping Night, and entertaining residents at the Seneca Lake Terrace assisted living facility by singing holiday songs. Torch Club members also presented a banner to the doctors at Finger Lakes Bone & Joint Center at the grand opening of their new MRI unit. The banner was made by Goodman Street members; it congratulated the physicians on their achievement and thanked them for their support of the Boys & Girls Club of Geneva. The Club was happy to be able to provide Thanksgiving Dinner to 50 members on November 27. Many thanks to the Geneva locations of Wegman’s, Wal-Mart, Tops, Madia’s, and BJ’s Wholesale Club for donations that made it possible! When Jayson Morales and his family moved to Geneva from Puerto Rico when he was 7 years old, it seemed only natural for his parents to turn to the Boys & Girls Club of Geneva to find him opportunities for after-school activities, sports and homework help. Eighteen years later, Morales can’t wait to introduce his son – who is only 15 months old – to all of the same programs. When old enough, he also went to the Teen Center, where he continued to find adults ready and willing to help with any homework questions that arose; he also helped out with programs for the younger kids in the summer and took part in a lot of sports, among other activities. “The Boys & Girls Club helped me interact with others and become more of a people person,” explains Morales, who is now a driver for UPS, working from the Geneva location. Morales became a Christian about three and a half years ago, something he says changed his life for the better. His favorite quote is, “For God so loved the world, that he gave his only begotten Son, that whosoever believeth in him should not perish, but have everlasting life,” John 3:16. Married for nearly two years, he is currently in the process of trying to buy a home in Geneva or nearby and plans to stay involved with the club once his son is old enough. In the meantime, Morales has found he still has a place at the BGCG – playing basketball at the Community Center whenever he gets the chance. The Boys & Girls Club of Geneva has recognized 16 year old Andrew Evans as Youth of the Year, the highest honor a Boys & Girls Club of America member can receive. He joins 51 exceptional teenagers representing more than 179,000 children who regularly attend New York Boys & Girls Clubs in competing for the New York State Youth of the Year title and a $1,000 college scholarship. Evans was recognized for his sound character, leadership skills and willingness to give back to the community. Within the club this past year, he has served as one of the head cooks for Healthy Cooking – not only cooking but also staying until the kitchen is clean. He has changed the club’s atmosphere by setting a positive, mature and respectful example that presents a healthy and fun learning environment in all aspects of the Boys & Girls Club. An 11-year member of the BGCG, Evans participated in Torch Club, a character and leadership small group club that focuses on community service. He has served the Salvation Army Red Kettle Campaign, stuffed envelopes for Center of Concern for their annual appeal, and annually volunteers for the Musselman Triathlon. This triathlon donates annually to the Boys & Girls Club of Geneva and in 2013, gave the club $12,000. Evans recently interned with a carpenter in the Geneva community in efforts to gain experience towards his long term goal of attaining a license in carpentry. He is interested in attending Hobart College in Geneva and pursuing a degree in architecture. The New York State Alliance of Boys & Girls Clubs is excited to announce that SEFCU, one of the largest credit unions in New York State, has agreed to be the 2014 Presenting Sponsor of the 2014 New York State Youth of the Year Program. If Evans wins at the state competition, he will compete for the title of North East Region Youth of the Year and an additional $10,000 scholarship from Tupperware Brands, the recognition program’s national sponsor. Five regional winners will advance to Washington, D.C., in September 2013, to compete for the title of BGCA’s National Youth of the Year. The National Youth of the Year will receive an additional scholarship of up to $50,000 from The Rick and Susan Goings Foundation and will have the opportunity to meet with the President of the United States in the White House. Emma Lawler has always loved working with kids, which is why as a college student she would spend her vacations volunteering with younger children. In the summer of 2010, she taught at the Boys & Girls Club of Geneva, teaching arts and crafts among other things. A club member from eighth through tenth grades, Lawler learned of the BGCG through word of mouth and went with friends to the Teen Center after school. 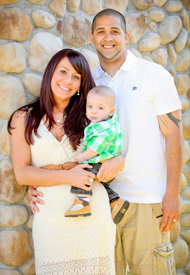 Lawler graduated from the University at Albany, SUNY, in 2010 with a degree in communications and a minor in political science. After graduation, she returned to Geneva to work for Happiness House. She then accepted a position with the Geneva Human Rights Commission, after receiving her paralegal certificate from Monroe Community College. Lawler helped organize Community Dialogues on Race with Executive Director of the Boys & Girls Club of Geneva, Arlene Francis and individuals from Hobart and William Smith Colleges. She is now the reception administrator for World Overcomers Christian Church in Durham, N.C. Next summer, Lawler will marry BGCG alum, Renard Flowers. This winter, 50 Hobart and William Smith Colleges students took part in volunteer orientation for the Boys & Girls Club of Geneva (BGCG). This orientation represents a more formal structure for the valuable relationship the club and the Colleges have developed over the years. With HWS volunteer help, BGCG has been able to continually offer a number of programs and services to our members. In turn, HWS students obtain practical experience to supplement service learning courses and make important connections with the club as a community organization. “Since the Boys & Girls Club of Geneva opened in 1996, we have benefitted from HWS students’ involvement each semester, whether it be basic volunteerism, service learning, internships and/or on a program development and leadership level,” explains Arlene Francis, executive director of the Boys & Girls Club of Geneva. A recent article on the HWS website describes the mutually beneficial relationship BGCG and HWS have developed: http://www.hws.edu/dailyupdate/NewsDetails.aspx?aid=17524. 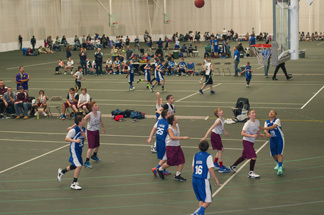 The Boys & Girls Club Basketball Tournament, which ends the travel league season, took place at the Bristol Field House on the HWS campus on March 22 and 23. Boys and girls divisions include third and fourth grade; fifth grade; sixth grade; seventh grade and eighth grade, in which the limit is two junior-varsity (JV) players per team. Teams for all divisions represented Newark, Midlakes, Victor, Romulus, Jordan-Elbridge, Naples, and Geneva. Those who have been participating or attending games of the travel league will have noticed the City of Geneva logo on uniforms. This year, the City provided money to the Club to support the league. Players practiced at the Geneva Community Center and traveled throughout the region for games in their division. See the Basketball Tournament photo gallery. See the Book Fest photo gallery. An anonymous donation was made to the recording studio this spring. The $7,000 provided for an upgrade of the recording studio, with new elements of equipment that will enhance the community artists’ experience and final results of professional recording. National Boys & Girls Club Week took place from March 23-29. 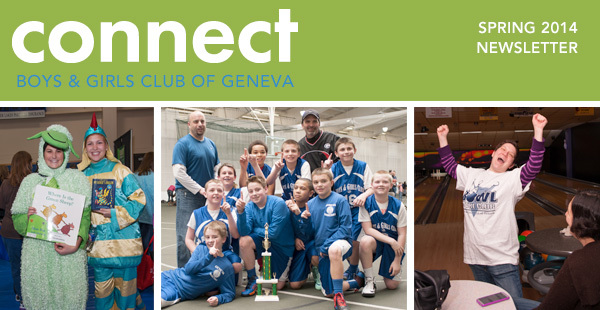 Community members were invited to learn more about their neighborhood club and find out what the Boys & Girls Club of Geneva does to support kids in our community. Youth Recognition Night was held on March 27 at the Geneva Community Center. The celebration recognized Members of the Month as well as the Youth of the Year Andrew Evans, and Jr. Youth of the Year, Karoline Head-Martinez. Dramatic readings, written by the Theater Club with the help of Terri Knight Miller, past president of the Geneva Theatre Guild, were performed by Milagros Vega Cruz, India Tyler and Tamia Robinson. The works highlighted: feelings of diversity and the importance of being an individual even if it means standing apart from the crowd; finding oneself through music while facing difficult life challenges; and the pros and cons of having power and the lessons learned from the abuse of power. Head-Martinez read her poem about the Club and what it means to her. Evans shared his essays on the importance of the Club and higher education, written for the NYS competition.